Share the post "As Bitcoin prices close above $4,000, technical analysts exude enthusiasm"
Investors continue to bolster the future fortunes of Bitcoin, beating away the bears and sustaining prices around the $4,000 level, but as BTC prices begin to close above this psychological plateau, the analyst community is beside itself with confidence and unbridled enthusiasm. Chart patterns are appearing which suggest that a run to higher altitudes is statistically on the cards, a rather alarming condition after considering the ravages of Crypto Winter and the massive meltdown that accompanied this period. Dr. Jean-Paul Rodrigue of the Department of Global Studies and Geography at Hofstra University recently put together the above chart to illustrate price behavior for a typical “bubble” formation in our financial markets. 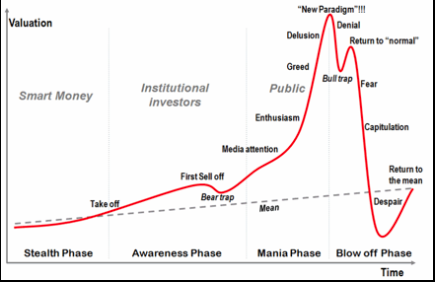 Every phase of this chart could easily apply to Bitcoin and its travails over the past decade. The obvious conclusion is that we are currently in the “Despair” phase, which ends by “a reversion to the mean”, a favorite forecasting axiom in technical circles that describes what might happen next. In other words, the odds are favorable at the moment that Bitcoin prices will rise with gusto. How favorable, you might ask? The technical community has been searching for that “Holy Grail” chart pattern that will confirm that better times are ahead, but the extremes that a few outliers are willing to traverse seem to raise as many questions as answers. A few notable analysts have literally flipped the charts to view inverse relationships from a different perspective. The goal is to find a pattern that matches a prior move, i.e., an indication that a repeat performance may be in the offing. In this case, analysts have revisited the latter quarter of 2018, when the group, as a whole, was predicting that a firm bottom had formed at the $6,000 level, only to have fate drive the prices down in November, coincidentally after stocks had taken a beating in the market as well. Prices finally hit bottom in December at roughly $3,150, but no one at that time was willing to step forward and predict that a final bottom was finally here. Most analysts at this time were gun shy and even forecasting further downward thrusts beyond the $2,000 mark. However, 2019 has been a different story. Yes, January was choppy, but the predicted fall to the nether regions never occurred. February marked the first month since July of 2018 that a positive return for a month was posted, and March has seen a repeat performance. The $4,000 level was still foreseen as formidable resistance, and $5,000 after that, but a trek past $6,000 would truly mark a resurgence in Bitcoin’s good fortunes and a potential move to much higher ground. As with forecasters in other financial genres, every prediction is quickly followed by a caveat, a way of protecting against accountability in the future. In any event, the current situation is interesting, and the months ahead should be more than interesting.